Soft Cover, 181 pages, 7 x 10. 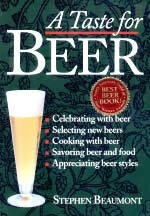 A Taste For Beer was awarded "Best Beer Book" by the North American Guild of Beer Writers. It is a timely guide to North America's new generation of pilsners, lagers, stouts, and ales. More than a comprehensive commentary on how beer can enhance the dining experience, it's a celebration of beer and its cultural significance, complete with an explanation of how North Americans lost track of their beer heritage in the twentieth century and an inspiring appeal to reclaim it. Author Michael Jackson says that A Taste For Beer was "investigated with the diligence I have come to expect from Beaumont. He'll make you a more discerning drinker, and you'll thank him for it."